Sarasota has some truly word class fishing off of the area beaches in the spring and fall. Several different species migrate through, following hordes of bait fish. Some of my most exciting fishing has been taking clients on Sarasota fishing charters, doing some Sarasota inshore Gulf fishing. When conditions are right, Sarasota beaches offer world class angling. The inshore Gulf of Mexico offers visitors the opportunity to cast lures and flies into schools of breaking fish. This is some very exciting fishing! False albacore and Spanish mackerel will be terrorizing helpless bait fish. It is a feeding frenzy and the action can be spectacular! We were greeted on a sunny fall morning with a sight that would make any angler’s blood boil. Every few hundred yards or so, the flat calm surface of the Gulf of Mexico was disturbed by breaking fish and diving birds. I eased the boat quietly into casting range of the nearest school of working fish and cut the engine. “As soon as the fish show, cast your plugs out to the edge of the fish”, I instructed my two anglers. Several tense moments passed before the water exploded thirty feet in front of us. Two Rapala X Raps were sent out into the fray, twitched once, and instantly devoured. A double-header on the first cast! 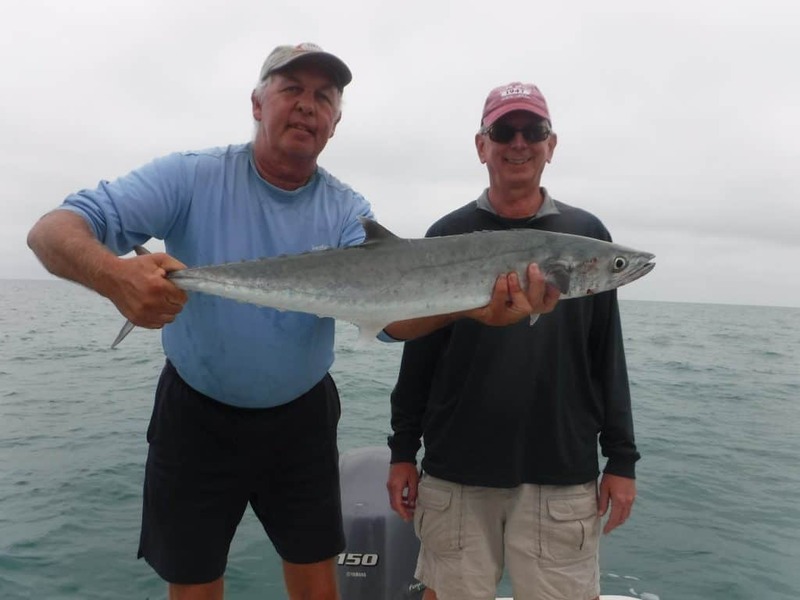 My initial thought was that we had tied into a couple of Spanish mackerel, but the long runs that threatened to “spool” our ten pound spinning outfits contradicted that. Ten minutes later we had our answer as a pair of false albacore reluctantly gave up their valiant struggle. After a quick photo, they were released to thrill other anglers with their speed and power. In the spring time and again in the fall, Sarasota is blessed with fantastic light tackle Sarasota inshore Gulf fishing off our beaches. This truly is world class fishing. Huge schools of bait fish will move through on their annual migrations. Game fish will be hot on their trail. While the primary species are king and Spanish mackerel, along with false albacore, other pelagic species such as cobia, tarpon, and sharks will also be encountered. Every season is different, but action generally peaks on Easter and again on Thanksgiving. Optimum conditions are water temperature between 65 and 75 degrees, along with easterly breezes and clear water. This offers anglers with small boats an opportunity to catch large fish quite close to shore. Point of Rocks on Siesta Key is a great spot to do some inshore Gulf fishing. The bars at the mouths of both Big Sarasota Pass and New Pass are great spots as well. However, the fish can be anywhere along the beach. Three artificial reefs were placed within two miles of shore off Lido Key between the two passes. These are fish magnets on the otherwise barren Gulf of Mexico floor and provide a great contingency plan. Action of some kind is practically guaranteed at one, if not all three, of the reefs. Several techniques are used in pursuit of these nomadic speedsters on a Sarasota fishing charter. The most exciting, when conditions dictate, is sight casting to “breaking” fish. A spinning rod with ten to twelve pound line is ideal and a reel with a smooth drag is essential. Casting rods can be used, although the light lures and baits make spinning outfits a better choice for most anglers. Small plugs such as a Rapala X-Rap are extremely effective baits that result in a high hook-up rate. Spoons, Diamond jigs, Gotchas, and Bass Assassin jigs with bait tails will also catch plenty of fish. White and silver are the preferred colors. Be careful not to use lures that are too big, the forage is usually quite small, better to “match the hatch”. A 24” piece of fluorocarbon shock leader is needed, start out with 20 lb in clear water and go up to 40 lb if cut-offs from mackerel become an issue. A patient angler will prevail when Sarasota inshore Gulf fishing. Charging around from school to school will only result in putting the fish down. Instead, sit and wait for a good opportunity. There will be days when it can be frustrating. However, at some point you will be in the right spot and get your opportunity. A trolling motor is a great asset, allowing the angler to fine tune the boat’s position. As with all fishing, vary baits and retrieves until a productive pattern is identified. The fish are usually quite aggressive and a fast, erratic retrieve will result in bone-jarring strikes. Most of the time, the reel handle can’t be turned too fast! This is a terrific situation to catch a nice fish on a fly rod. Long casts are not normally required and the fish are hungry and cooperative. An average sized little tunny will get deep into the backing on its initial run. As with spin fishing, try different retrieves and flies. Allowing the fly to settle a moment, then retrieving it back in with short, hard strips is often productive, while at other times just letting the fly sink through the bait, seemingly helpless, will trigger a strike. A 7 weight rod is fine for Spanish mackerel while a 9 weight is a better choice for false albacore. Floating lines with a nine foot leader work well. 20 pound tippet is good for the false albacore. They can be a bit leader shy. A 40 pound bite tippet will help reduce cut-offs from the mackerel. Fly selection is pretty basic. #1 white D.T Special flies, #1 white Clouser Minnow flies, and #1 white glass minnow flies are the top producing flies. When fish are seen breaking on the surface, the angler should approach up-wind of the fish. The engine should be cut and the boat allowed to drift down on the fish. Spanish mackerel tend to stay on the surface in one spot longer than false albacore. A cast into the middle of the fish should produce a take. False albacore move a lot faster and do not stay up on the surface. Anglers need to determine the direction that they are moving and “lead” the fish when fly fishing. Trolling is an extremely effective technique that will usually put more fish in the boat than sight casting when Sarasota inshore Gulf fishing. This can be particularly true on mornings when there is a chop on the surface, when the fish are not showing, or when targeting king mackerel. Plugs and spoons are the two most productive lures. Both lures can be trolled using a light trolling sinker or behind a planer, but a plug with a large lip will “trip” the planer. Shallow and deeper running plugs are effective on all species. Spinning and conventional rods are both fine for trolling plugs. Simply tie the lure to a 6’ piece of 80 lb fluorocarbon. Rapala X-Raps, Yozuri 3 D Minnows, and gold Bombers are all effective plugs. The key to trolling several lures without tangling them is to vary the depth and distance that the lure is let out behind the boat. I use a “count back” method when inshore Gulf fishing. The shallowest running bait is let out first with the engine idling in gear. This is usually a plug but can also be a spoon/trolling sinker combo. Count out to twenty five and then put the rod in an outside rod holder. Next shallowest would be the #1 planer. Count out to twenty while letting the line out. Put that rod on the other side of the boat. Last, and deepest, is the #2 planer or deep diving plug. Count out to fifteen and set the rod in a holder as close to center as possible. Now there are three baits at different depths and distances, allowing the boat to be turned without the lines fouling. Increase speed to four to five knots and troll while looking for birds, bait, and surface activity. Keeping the boat moving after a strike can result in multiple hook-ups. While I prefer the excitement of tossing artificial lures and flies, drifting and slow trolling live bait will often out fish all other methods, and will usually catch the largest fish. Live shrimp and small bait fish that can be cast-netted up are best free lined on light tackle using a 2/0 long shank hook on a 24” piece of 30 lb leader. This works great for catching Spanish mackerel and false albacore. Larger species such as king mackerel, cobia, tarpon, and sharks prefer a large threadfin or blue runner. Cast out a Sabiki rig into the bait pods and use a slight jigging motion to attract the bait. Once procured, use a heavy spinning rod (tarpon tackle is perfect for this) with a 5’ piece of 80 lb fluorocarbon leader and a 6/0 live bait hook. Drift the bait out behind the boat, a cork may be required if the wind and tide are slack. Live bait fish can also be slow trolled. This is an extremely effective tactic for large king fish. A “stinger” rig is preferred. This consists of a long wire leader with two hooks about 6” apart. The bait is attached by the nose to the first hook, the second hook swings free. The bait is let out 100 feet behind the boat and slowly trolled around the edges of bait schools and over structure. The boat should be in idle and moving as slowly as possible. Drags are set lightly allowing the fish to run after a strike. In most instances, the fish will be hooked in the side of the face with the stinger hook, necessitating the light drag pressure. A couple of seasons back, I was out on the beach on a charter the day before Thanksgiving. It was a little choppy and the fish were not showing, so I had my clients drifting live baits out behind the boat. 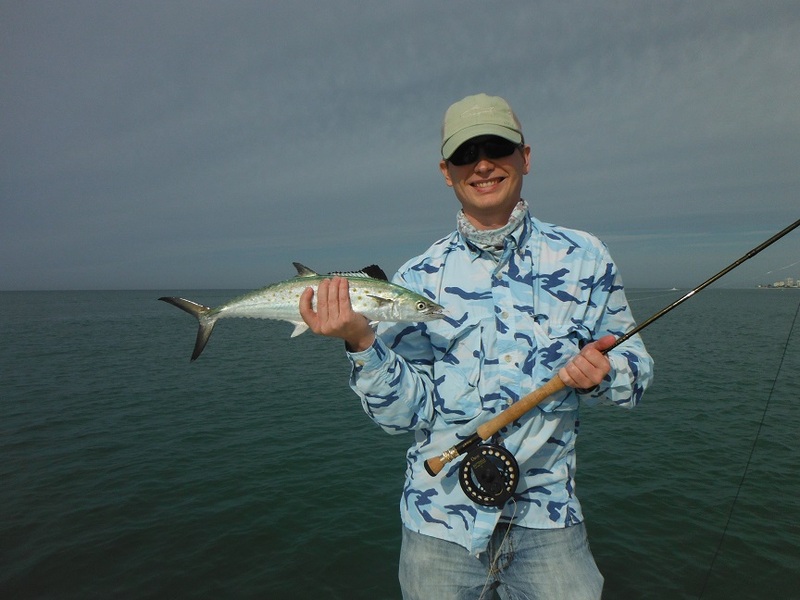 We had landed a small king and several nice Spanish mackerel when a rod baited with a big threadfin doubled over. Line peeled off the reel as my client scrambled to get the rod out of the holder. His face lit up as a hundred pounds of silver fury leapt several feet out. of the water. Yes, a tarpon at the end of November! You never know what you might hook into off of the Suncoast beaches. Come and experience Sarasota inshore Gulf fishing for yourself! Planers are deadly, but require the use of heavier tackle. A #1 planer on a 15-20 lb conventional outfit and 20 feet of 50 lb leader and will dive down six to eight feet at five knots. A #2 planer on a 30-40 lb conventional rod and 20’ of 80 lb leader will work the 12’-15’ depths. Match the spoon to the size of the planer. A 2”-3” Clark spoon works best on a #1 planer while a large King spoon works better on the #2 planer. Quality swivels on both ends of the leader will minimize line twist. Watch the teeth! Spanish mackerel and king mackerel have VERY sharp teeth. It can be easy to become careless when in the middle of a fishing frenzy. A release tool is a great aid. Fish that are going to be kept should be released right into the cooler. Fished to be released should just be unhooked over the side. False albacore will fight to the death, literally. It is important to use tackle heavy enough to subdue them in a reasonable amount of time. Also, when releasing an albacore, point it head fist towards the water and briskly shove it into the water. This will get the water moving across it’s gills. Anglers may be tempted to use wire after getting several cut-offs from toothy mackerel. This is understandable. However, the number of strikes will be decreased, especially if the water is clear. Several manufacturers make wire that is limp and can be tied in knots. This is a good compromise. Tip # 5 Birds are your friend! As the game fish feed on minnows, they will drive them to the surface. Birds will see this and dive in on the helpless prey. It is much much easier for anglers to see birds working from a long distance than the actual fish feeding. Small white terns are a sure indication of feeding mackerel or false albacore.